Monitoring your Bandwidth in your network is crucial to understanding what is going on in your perimeter. Many times you can even catch malicious behavior and programs that have made their way into your network unbeknownst to you or your network monitoring systems. Below you will find a quick overview and review of each product, along with official product website and download links to accompany them as well. We did Not include any software packages or programs from SourceForge, as many of those are out-of-date and no longer maintained. If you have any suggestions, please feel free to contact us via our contact page and we’ll be sure to add them as we see fit. 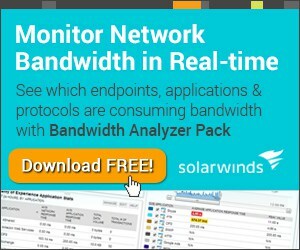 Solarwinds offers a FREE Real-Time monitoring utility to track network usage/bandwidth within your network by interface. Easy to setup and manage using SNMP, Solarwinds’ offering is amongst the best in terms of viewing inbound/outbound traffic on an interface level of any system setup with SNMP within your network. 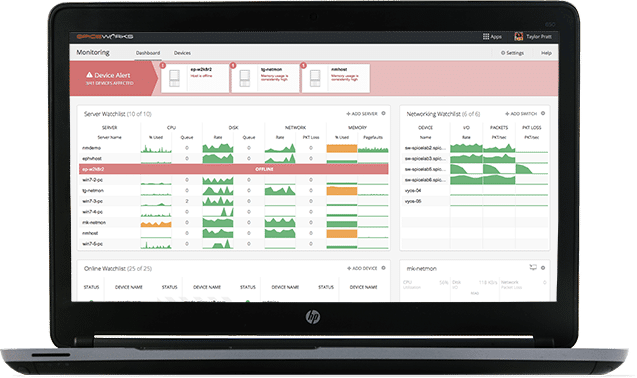 PRTG is a well-known network monitoring solution as well and also provides a nice little utility for monitoring traffic within your network. The tool allows you to monitor up to 100 sensors for FREE with no extra charge, with the ability to buy more sensors as needed from there. 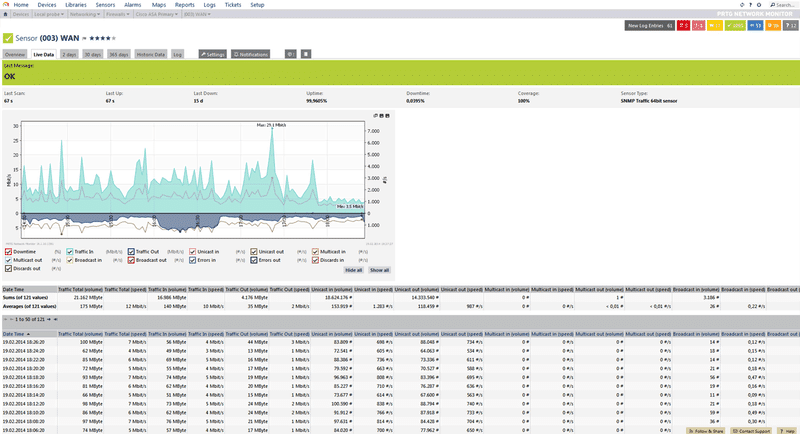 Networx utility is geared towards individual desktop monitoring rather than remote tracking of bandwidth like the others mentioned in this post. 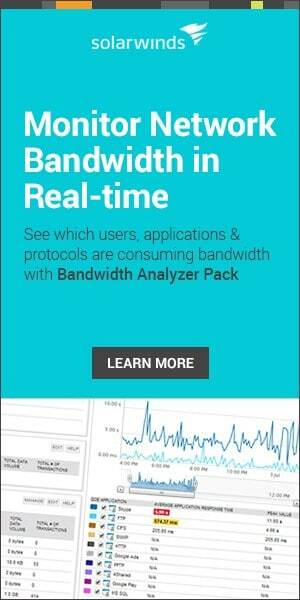 If you want to monitor the bandwidth on your own PC or Desktop, then grab this tool and install it locally. It provides nice graphs of Speed, Usage and Quotas per Daily basis, as well as Download speeds. 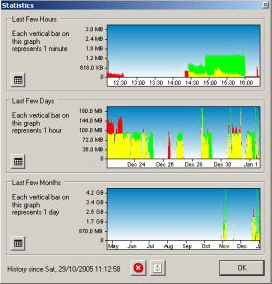 Similar to the Networx software from above, BitMeter 2 gives you the ability to visually graph and track your internet connection on your own computer. Different colors represent wither Upload or Download speeds which update every second. You also have the ability to view Statistical information based on Hours, Days or Weeks. Rokario is another desktop solution for your PC that monitors your local ethernet card for inbound/outbound traffic and network usage. It includes a nice themed GUI that is options for viewing remote IP addresses, Port numbers (local and remote), and amount of data received and sent. 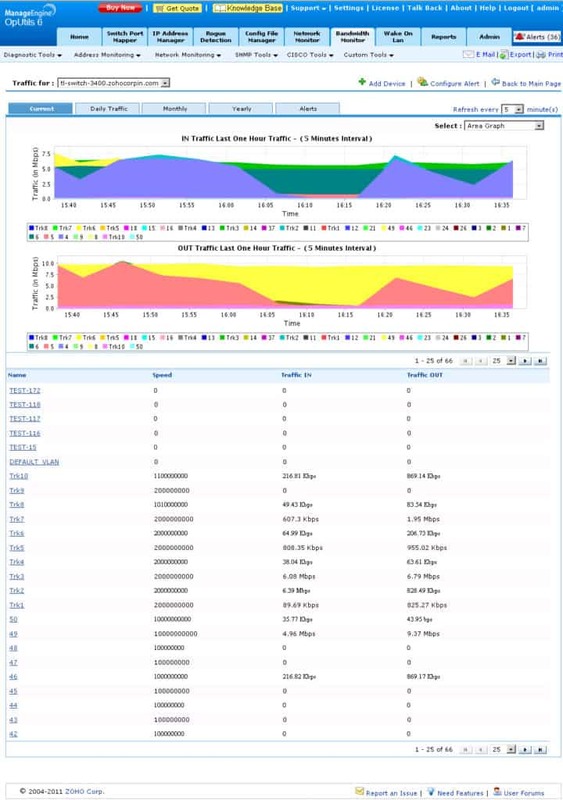 ManageEngine OpUtils has a great add-on for Network/Internet Bandwidth and Traffic monitoring that provides a real-time view into any SNMP device on your network on a device or interface level. Bandwidth utilization is tracked and recorded to view upload/download speeds and overall utilization. Main features of this software include its Agentless design, historical usage trends and graphs, threshold alerting based on predetermined values (that are customizable), the ability to monitor Speed/Packets/Volume and Bandwidth. This tool has the ability to export bandwidth reports to XLS as well. Think Broadband has a nifty little utility called tbbMeter that is great for keeping track of your internet usage. It isn’t nearly as full featured as some of the other options, but will still help you track your internet usage on your own computer. If you are a home user and want to keep an eye on your upload/downloads and the amount of bandwidth you are using, this is a great utility to do so. Some main features include Daily/Monthly/Weekly stats, Alarms for Exceeding Bandwidth usage, Stopwatch for Download Speed tracking, Ping utility for Latency tracking/timings (good if your a Gamer), Graphs for Usage and Protocol Performance analysis. 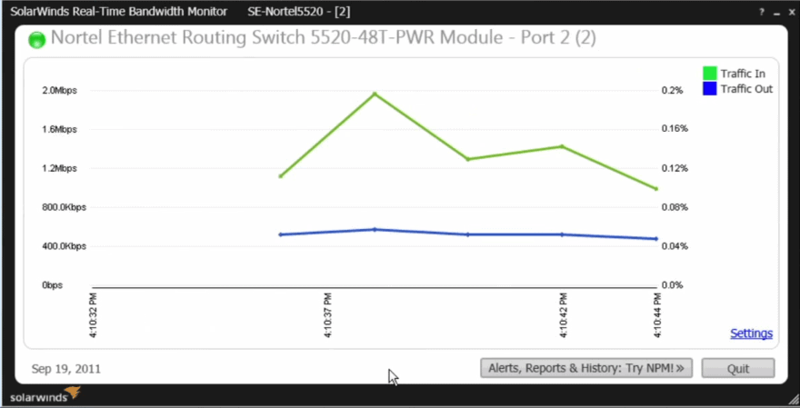 As many of the other utilities/tools mentioned here, BWMonitor tracks bandwidth only on the computer you install it on – instead of multiple computers as Solarwinds, PRTG and ManageEngine. BWMonitor features include a “speed stopwatch”, transfer speed/rate recorder and usage notifications. It works with all the major releases of Windows including Windows 98, Windows Me, Windows NT 4.0, Windows 2000, Windows XP, Windows 2003, Windows Vista, Windows 7, Windows 8 , and Windows 10 . Spiceworks has a built-in feature for monitoring your bandwidth usage within your network on certain devices within their Spiceworks installation. The Download free and fairly small, weighing under 200MB total. 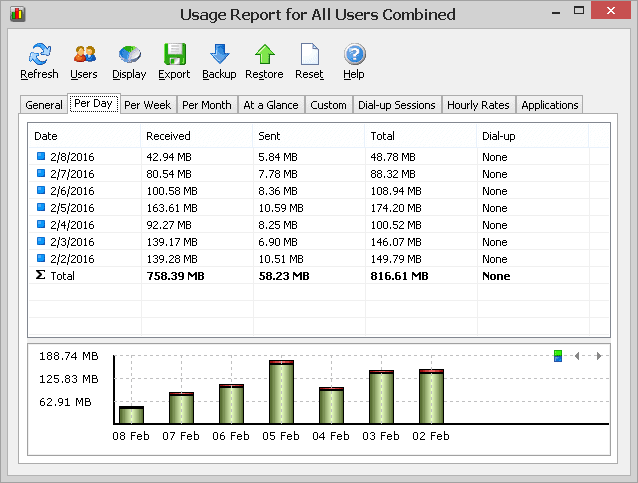 BandwidthMonitorPro.com offers a small utility for keeping track of usage on your desktop computer. It has a plethora of features and settings that can be seen on their screenshots page.